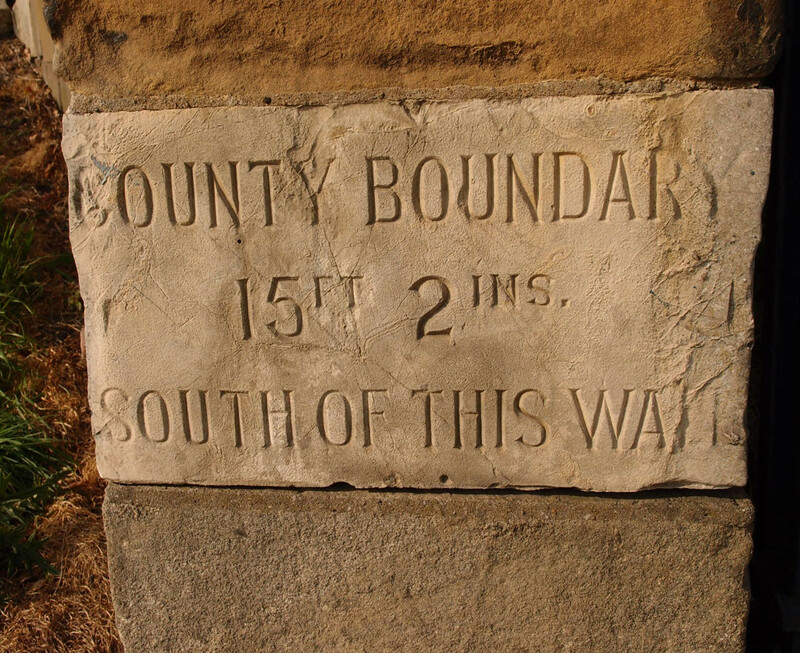 On walks through the local landscape we might notice boundary markers like the one above, on Tower Street. These old examples are generally handsome and/or interesting, and I’ve included several of them on previous pages over the years (eg here and here). I’ve also gathered quite a collection of photos of less handsome notices marking the edges of territories and ownership of land. Here’s one example of a rather baffling sign on a wall near the City Screen development off Coney Street. The piece of land it referred to was apparently dull and unremarkable, so much so that I can’t quite remember where it was, but a rough idea of its location is marked on the map accompanying this page. West Offices is of course now the offices of City of York Council. Its main entrance is on the other side of the building. On this side, where the sign is, there’s a car park and a road running up to Hudson House and the old arches under Queen Street bridge. The sign is rather amusing in its emphatic wording and huge size. It looks a bit odd as it’s next to an open green space that has no apparent fencing or other boundary and is clearly well-used by ‘the public’. 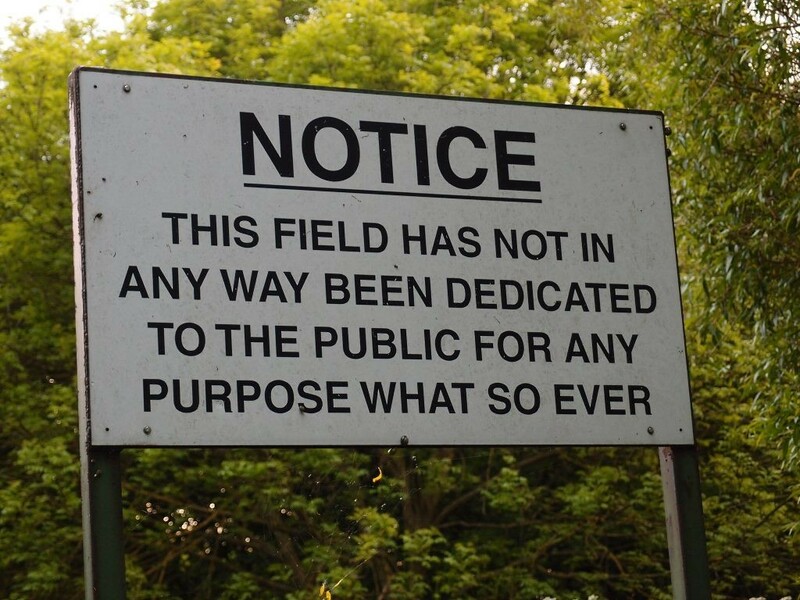 Presumably the sign is to make it clear, in legal terms, that we shouldn’t try to claim it in any way, but realise that we’re just being allowed to use it. We may feel that, in the words of the song, ‘this land is our land’, but it isn’t. Access is being allowed to us but we shouldn’t think of it as a right. I wonder how often we think about land ownership and our right to walk in certain places. It’s something I’ve been thinking about a lot in recent years, with particular reference to particular places I value, green spaces. The people who have been used to using the playing fields on Windmill Lane as their local green space have had to think about the issue, after a planning application for permission to build housing on it (Press story on this link). This was discussed at a planning committee meeting on 20 April (on YouTube on this link) and it highlighted the whole subject of land ownership and use. Many local people feel a sense of ownership after many years of use, but they’re not the owners of the land. It’s owned by York St John University, who can do what they like with it. There’s a petition, on this link. Over in Acomb there are similar concerns about the playing fields of the old Manor School site (Press story on this link). 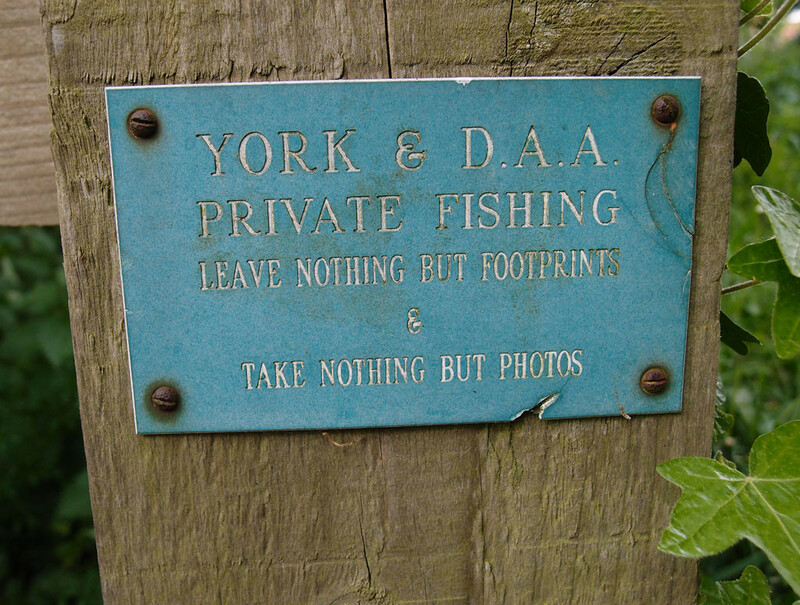 The grounds of Bootham Park, the subject of many previous pages, have recently acquired some particularly jarring and repetitive signage too (ignored by the geese enjoying the grass). I’m angry about the issues around this hospital and its grounds. The sign forbidding recreational purposes seems, to me, overly officious, offensive and unnecessary. ‘NHS Property Services’ clearly have enough funds available to fill the place with ‘keep off’ signs. 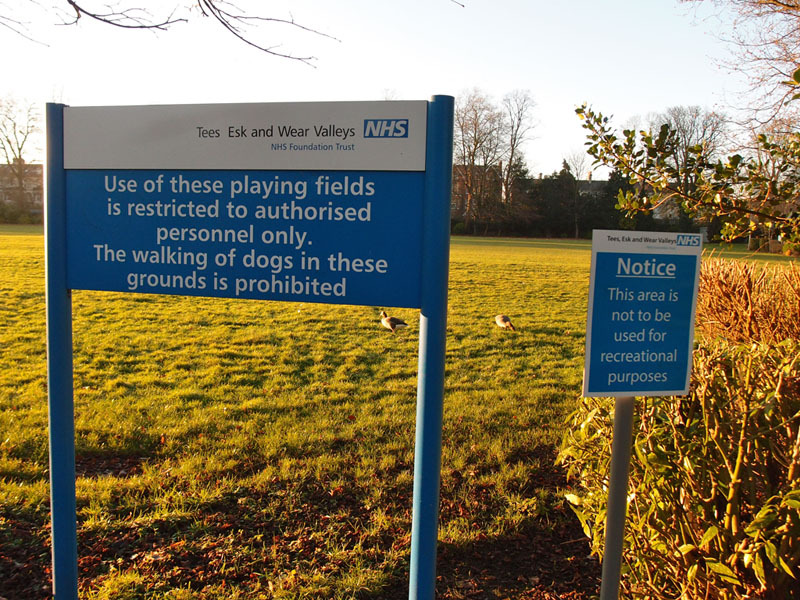 This green area at the front of Bootham Park hospital used to be known as the ‘Gala field’, but that was a long time ago. Still, we have our strays, don’t we. I’ve been visiting Bootham Stray quite a lot recently. Exploration of its various bits and boundaries reveals at least one fenced area blocked from public access. More on that story later perhaps. There’s also the railway line (York to Scarborough) running through it, and here we find a completely confusing cluster of signs, which could perhaps win some kind of prize for confusingness. There’s a gate, with a matching gate on the other side of the track. There’s a large sign with detailed instructions for crossing the line safely. Both of which suggest that this is a crossing. 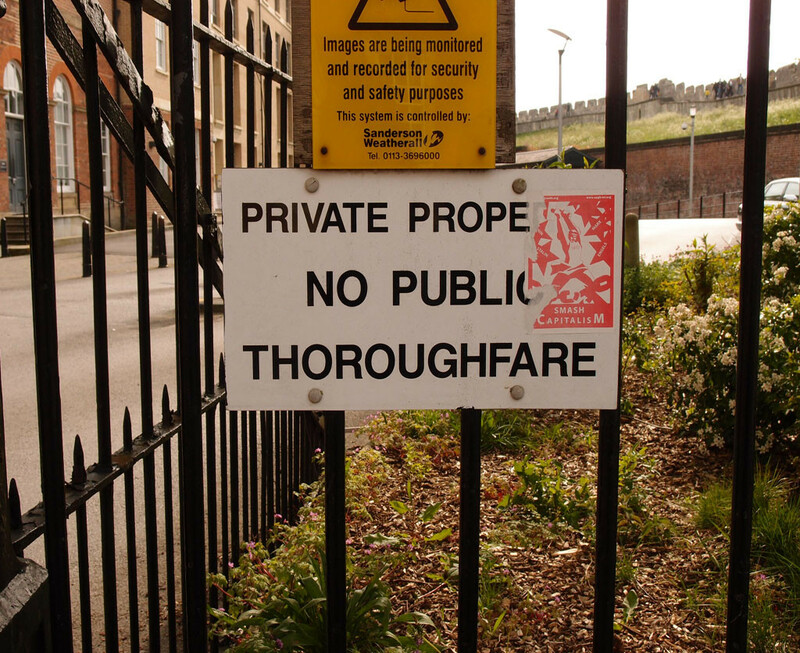 However, the gate is locked, and there’s another sign indicating ‘trespass site identified’. Then of course the standard signs about trespassing on the railway, etc. The crossing here was presumably put in for a local farmer originally. The large gate suggests so. And so you could say, why should we (the public) be able to cross the line here? Two reasons – because it cuts in half the stray land, which is supposed to be open for the residents of the city to enjoy, and secondly because there’s another crossing over the line just a little further up the line which appears to be used regularly, with a stile to get over the fencing at the side of the line. So crossing the same railway line on foot is okay at one location but not okay a little further along it. It’s a bit daft isn’t it. The difference appears to be that one of the crossings is on the line of a public right of way. The kind that are marked on maps as dotted or dashed green lines, the kind we perhaps take for granted. 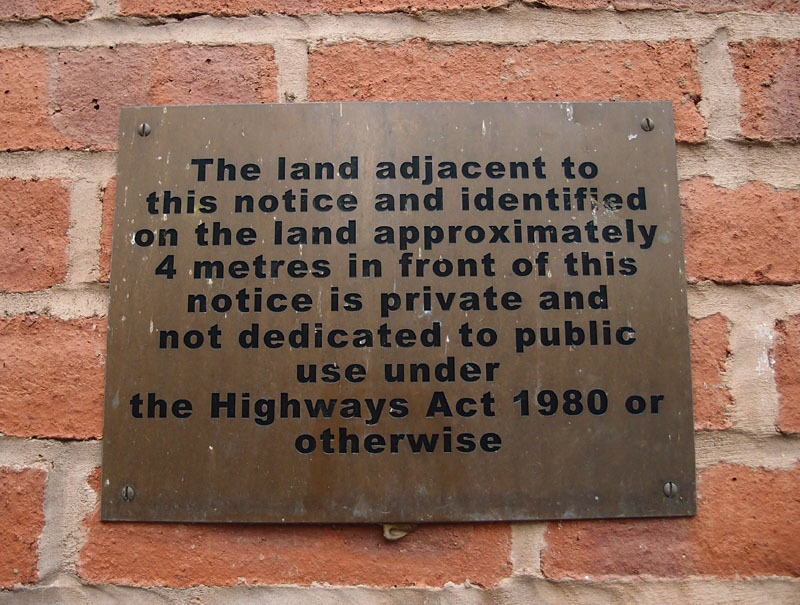 Those rights of way are so important, making their publicly accessible way between the privately owned land, owned by individuals and organisations. They’re not always preserved, and can be closed or diverted, but where they survive it’s good to see that even the railway network, cutting so confidently through the landscape as it did, has had to accommodate them. 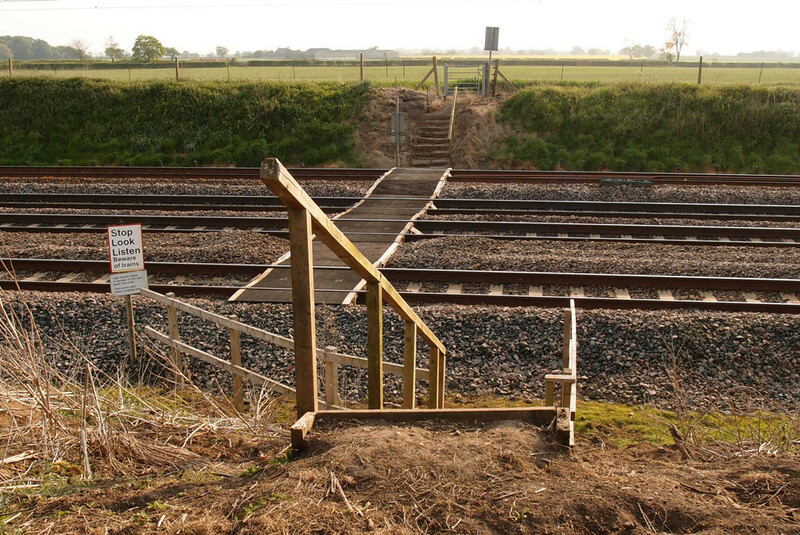 A startling and rather exciting example of this was discovered on a recent bike ride, which saw a change from the planned route when I looked at the OS map and noticed a right of way going up to and apparently across the East Coast main line, near Shipton. My companion thought it would be an underpass, if the route still existed as indicated on the map. We had our doubts, but a quick cycle down the marked right of way at the edge of a field, and there we were, and rather surprised to see that there wasn’t an underpass, just a bit of tarmac across the line, some steps at either side. And of course the signs. Rather more dramatic wording than the ones by the York-Scarborough line. With due care and attention, and looking both ways, the crossing was made. On the other side the public right of way continued, a beaten earth track through the middle of a field. As we cycled across its rutted bumpy ground I thought about how wonderful it is that rights of way are so inscribed in the landscape that even cross the East Coast Main Line doesn’t stop them. But also thought about the larger green areas closer to the city, how under threat they are, how I’m not sure I believe the strays and other apparently protected areas are properly protected and free from the threat of development in the future. But anyway, let’s focus on the fact that this rather haphazard journey here on this page has led us out away from the city and to a field. After many rather baffling, unclear or downright forbidding signs, let’s end the page with a gentler and friendlier one, noticed later the same day, on the riverside lands we reached on the other side of the railway lines. This website is a place where I share my observations, thoughts, local knowledge and research, and it continues to build a sense of place, as it has done for many years. It’s a personal project, a carefully compiled community-minded resource. If you’ve enjoyed it and would like to express thanks and offer support, there’s now a way to do that, via the button below. For notifications of new pages appearing, join the mailing list or follow me on Twitter. Interesting about the railway crossings. 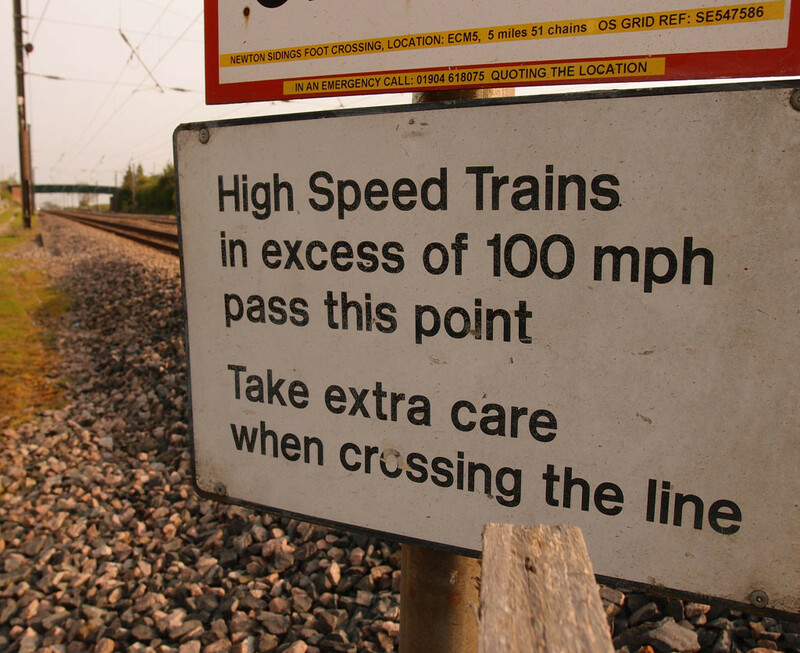 Network Rail regularly review and extinguish crossings, often without reference to users. Currently they have a list of 58 crossings nationally that they want to close. The link opens as a spreadsheet. One of these is at Kirkham Abbey and the revised route takes walkers on to the road level crossing which is certainly not an improvement for the walker. The Ramblers Association are trying to persuade Network Rail to preserve more of these crossings and have a policy statement on their website about this. 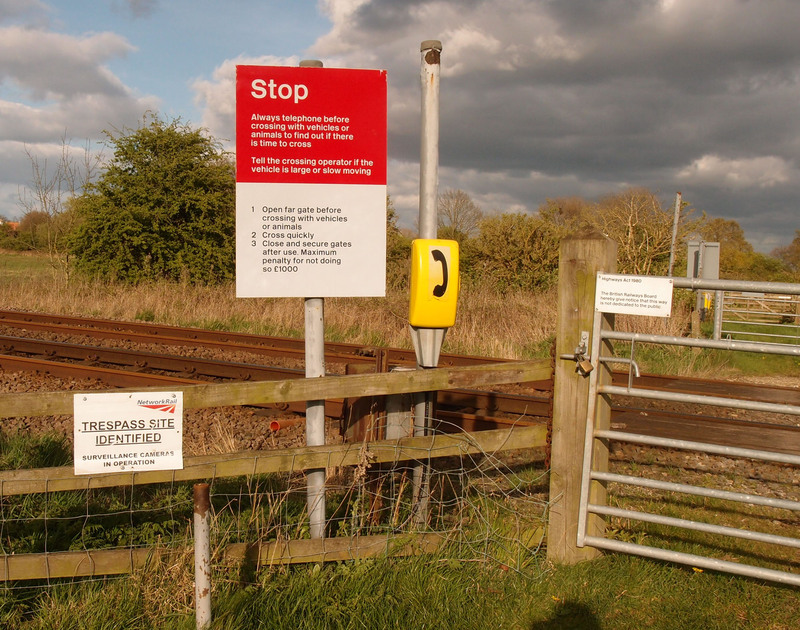 Although Network Rail have 58 crossings on their National list dated February 2017 the Ramblers are talking to them about 115 in the East Anglian Region alone that it is proposed will be closed. I still wouldn’t like to cross the East Coast Main line on foot with trains travelling at speed. Thanks John, excellent info, thanks for adding it. 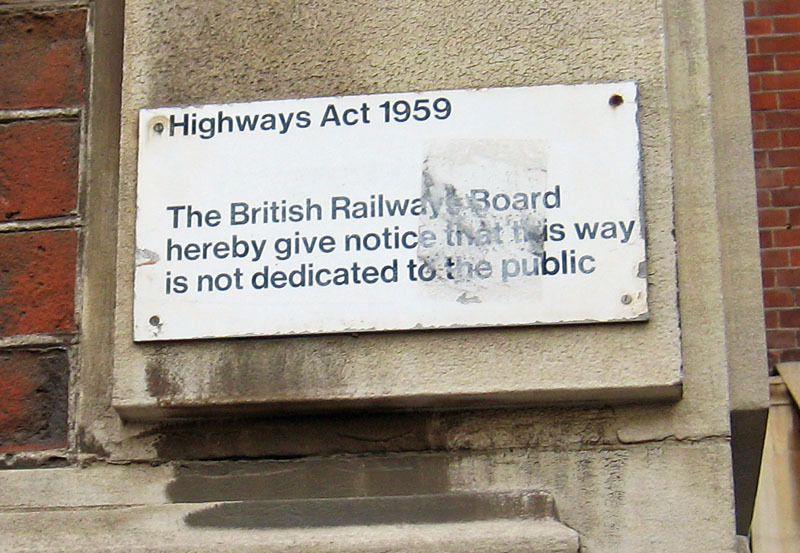 I did think about Googling for more on the rights of way over railway lines when writing the above piece, but didn’t. Perhaps just as well as it’s rather controversial, clearly, and I may have ended up diverting into opinion/ranting. I notice you mention the Kirkham one, that was the first railway line I crossed via a right of way and stiles for the purpose, many years back. It’s included on an ancient page I compiled many years ago (dating from 12 years ago today, coincidentally). I have to say too that crossing the East Coast Main Line didn’t feel as dangerous as crossing the A64.